Franz Fühmann (1922-1984) was one of the most important German writers of the post-war period, famous far beyond the borders of the GDR even during his lifetime. He was also a matchless book lover and book collector. His working library of approximately 17,000 volumes includes literature from a wide range of fields. Its key areas of focus are closely bound up with his own literary work: German-language literature of the 18th-20th centuries, 19th and 20th-century English and French literature, fairytale collections, mythology, art, philosophy, religion, history, politics, sociology, psychology and psychoanalysis and even technical literature on mining, as well as numerous reference works and encyclopedias. They include a large number of valuable first editions (especially of Expressionist literature) and several extremely rare limited-edition private printings, as well as books including original graphic works. The more than five meters of presentation copies reflect the high esteem which Franz Fühmann enjoyed as a writer and a human being – the list of prominent names is long, including two Nobel Prize laureates. A unique feature of great interest for literary scholars, researchers and Fühmann experts is the abundance of underlinings (often in color), marginalia and notes in the books of his library, and the index boxes (6 index boxes stuffed to bursting with filled-in index cards) that are intimately connected to them and also form a part of the library. Another typical aspect is that Fühmann often marked the title page of his books with his name. Alongside books and magazines one also finds thematic collections of newspaper and magazine clippings or booklets and brochures, along with photos, maps, art prints and the like – as well as many handwritten and typewritten manuscripts, early drafts of or notes for his own works, as well as manuscripts by other writers and postcards and letters which he received (from colleagues such as Uwe Greßmann, Rainer and Sarah Kirsch, Wolfgang Hilbig, Christa Wolf, etc.) 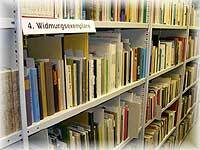 Thus Franz Fühmann’s library has the quality of a literary estate as well as a working library. During his lifetime, Franz Fühmann’s library was divided among three locations: the apartment on Strausberger Platz, the shed where he worked in Märkisch Buchholz and a storefront apartment in Berlin. In early 2003, this unique book collection was brought together for the first time in the Historical Collections of the Zentral- und Landesbibliothek Berlin and made accessible to researchers, clearly organized by subject.